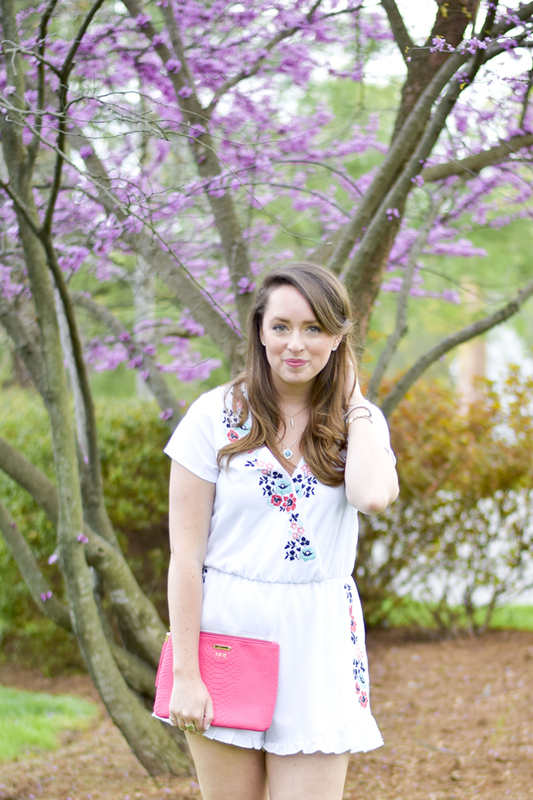 White Embroidered Romper (only $44!) // Gigi New York Clutch // Tory Burch Sandals // Turquoise Necklace (adjustable) // Gold Necklace (adjustable) // BITE Lipstick in "pastille"
Warmer weather means it's time to break out the rompers! 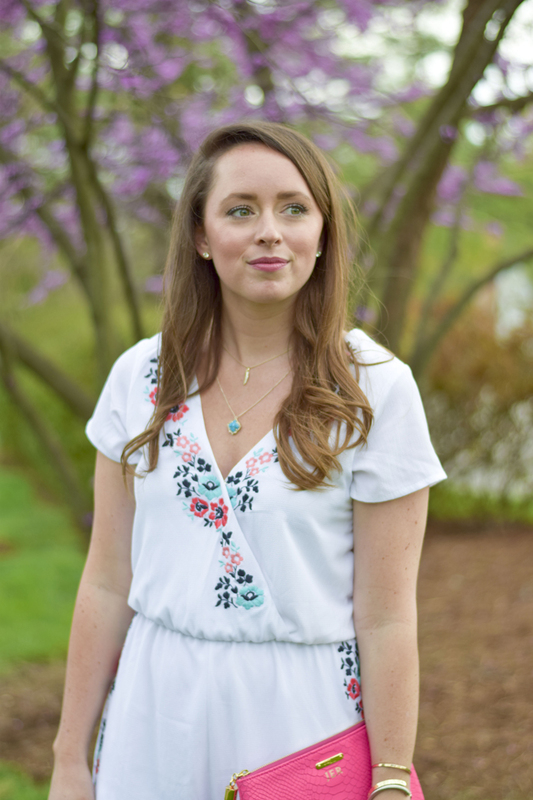 I was explaining to my boyfriend over the weekend why rompers are the best thing in my closet during those hot summer days (besides my beloved maxi dresses)... the first thing that came to mind is A) it requires no matching/pairing. The next thing was B) I don't have to worry about a wardrobe malfunction with a dress flying up. The last thing was C) it's basically a built-in matching top and shorts set ;) I mean who doesn't just swoon over that?! I love that rompers give me a bit more shape than my go-to swing dresses. This one feels light and breezy but I have some shape to my waist. I can sit in the car for a long ride to the beach and then hop out and go straight to dinner! Now I'm ready to hit the beach... hurry up, MDW! I also want to take a second to talk about my two necklaces - both are adjustable!! I've been wearing this turquoise stone and gold coral necklace non-stop. I wear them alone, layered, one long and one short, both long, choker, etc. The possibilities are endless and I can't get enough. The back of the necklaces have a little piece that you can slide up and down the two ends to change where the charm sits on you. Even the ends hanging down the back of your neck look pretty in my mind! If you're looking for a piece of jewelry that you can wear every day and then switch the look up - buy one of these two asap. You won't regret it!! Loving the details on this romper!! So perfect for spring-ing into summer :) Xo!